This distinctive case will certainly catch anyone’s eye. Consisting of an anodized aluminium shell and soft foam interior, your iPod can travel in comfort knowing that not one mark will come to it. When you see this case, you think, “Woah! That’s massive!” Those were my initial thoughts. However after using it for a week or so it turns out that this case isn’t so bad. 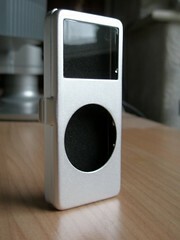 It’s designed so that you can throw around your iPod without damaging it. It’s ideal for someone like me who’s often late in the mornings and just needs to get the iPod, chuck it in the bag and out the door. 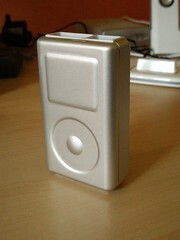 This is a complete solution for protection for your iPod from hectic lifestyles. Be confident that it will not break with this case. The case itself closes off access to the screen and controls. The only thing that is left exposed is the headphone jack and hold switch. A rubber stopper at the bottom can be removed to expose the data port. Bit of a shame that the scroll wheel and screen are covered by the case but it does offer just that little bit of extra protection. It would have been nice to have seen a screen put in but in this case Matias have gone the extra mile to make sure nothing can ever happen to your iPod. 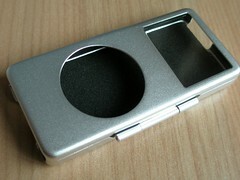 The case is designed to fit all full size iPods including the video iPod. 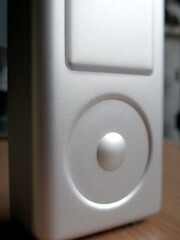 Extra padding is included for the slimmer design iPod and works very well in providing a comfortable ride. Matias market this as a total access when open and total protection when closed case, which is the justification for the design. Other facts and features you might like to know about it is the EVA foam. It acts as a cushion for your iPod in the event of a drop. I’ve tested this with my own video iPod by reluctantly dropping it from a height of about 1.5 metres and did it several times at different angles on a hard floor. Not one scratch appeared on the case and the iPod worked perfectly fine after it. This is a testament to the strength and design of the case because I’ve dropped an iPod mini before in a case and it didn’t survive and that was after just one drop. Another fact you might want to know is the Armor Clip. Unlike other iPod cases, you usually get something protruding out of the back of the case for attaching an optional belt clip. On this particular unit there is no such feature. It’s a pure smooth and flat surface on the back. The belt clip is attached using an adhesive chemical and Matias rate this to be able to survive 60 pounds of vertical force before it comes off. So you don’t have to worry that the ‘glue’ might wear off over time. Not impressed by that figure? Ok how about if it does and it breaks, they’ve got a 100 year warranty. Nope. That’s not a typo. They offer a One Century warranty on the Armor Clip! That’s definitely a first from any manufacturer. Alongside the iPod video version, you also have the iPod Nano version. Neck strap, screen view and exposed scroll wheel are all features that are different to the big brother version. 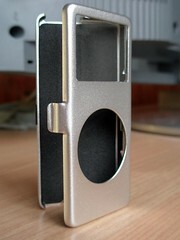 The case is made out of the same material; a shell consisting of an aircraft-grade, light-weight aluminium. Matias definitely wanted to make sure that the microscopic size of the Nano could be shown of. This case is a direct contrast to the big brother version – it’s designed specifically for the Nano and makes your Nano only millimetres thicker which is a definite plus. If I had to describe this case in one sentence, I’d say it’s a premium case with a no-compromise style that allows you to retain the Nano ergonomics and offers full and more than adequate protection for what goes inside. Great thing about this case is the ability to see the screen and have access to the scroll wheel. The inside uses a neoprene material to keep the Nano safe, secure and scratch-free. The neck strap again proves that this case was designed with the word streamline at the centre of the brainstorm. I personally like the fact that Matias boast about the extra lengths they go to when designing their product range. Each of their cases is hand inspected before leaving their workshop so you can be sure that everyone that gets loaded on the van is of pure quality and has no compromises. Bottom line is if you are looking for the ultimate protective case, then look no further, because you’ve found it. This is iPod case is unmatched in this particular iPod market segment and I challenge other manufacturers to come up with a case that can rival the design, style and ergonomics of this case.